In 1782 <wrong date?> Colonel Billopp was Superintendent of Police of Staten Island. 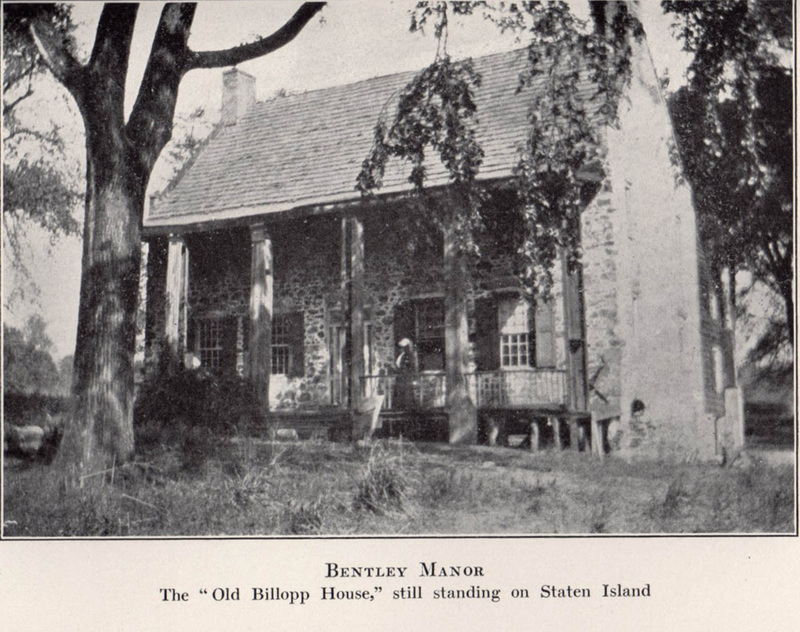 His estate, Bentley Manor, and also the estate of his father-in-law, Benjamin Seaman, were confiscated by an act of the New York Legislature in the year 1776.
the Colonies to return to their allegiance. Lord Howe, General Kniphausen, Colonel Simcoe and other officers of rank were frequent guests of Colonel Billopp at this old house. 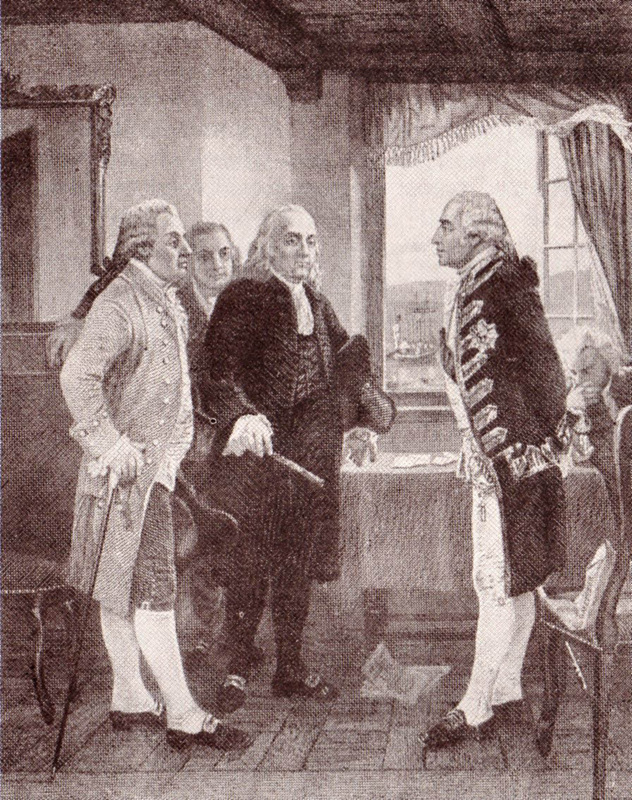 South Carolina, Benjamin Franklin, Pennsylvania; Lord Richard Howe, Henry Strachey, his secretary. and placed him and his possessions in the proscribed list. when the friends of the family are respectfully requested to attend.' "
From the same work is the following description of Colonel Billopp: "He was a very tall, rather slender, soldierly looking man when in his prime. the Island. No one went from his door at the old Manor hungry. to talk to them and give advice for their welfare. He was very popular. Staten Island and retire with his family o this colony, wherein he since resided at St. John, universally respected. Robinson, married Doctor Bayard of St. John. The second daughter, Mary Robinson, married Major Short. — Billopp, who married Miss Kortright; Jasper and Edmund, unmarried; and Frances, who married Mr. Townsend. The Colonel's third daughter, Katherine, died in infancy. Mary, who married Archdeacon Willis, and left children, and Anne, who died unmarried. fourth generation, and are now scattered throughout the Dominion of Canada and England. They are people of whom any community might well be proud. The four grandsons of Mary Billopp Willis are the Rev. Robert S. Willis of England, the Rev. Cuthbert Willis of Halifax, John Willis of Halifax, and William Chris- topher Willis of Glasgow, Scotland. James saved life of Queen Elizabeth and accepted a Court appointment James has a son named Christopher (2) who was a merchant in London. Christopher was a governmental contractor under Charles the First. He married a lady belonging to the court circle. pirates. This is the Conference House Christopher Billopp. Christopher (of Christopher) sails on ship Bentley from England to Newfoundland and then down to New Netherlands. It is not known if on his own or per King Charle I. This action is under question since no record of Billopp coming to America prior to 1674.
was appointed Governor by James, Duke of York. He formed an army of 100 (first time army raised in England for service in America). up to navigate around the island. Andros appoints Billopp Commander of Delaware and Bay. Holds this for 2 years. of 1681 acres of land "over against Amboye". landed at Philadelphia with his mother, Katherine, a widow of Jaspar Farmar, Jr. Also two daughters - Elizabeth and Katherine. In this period Billopp maries Katherine Farmer, widow of Jaspar Farmar Jr. No children. King since a pension is assigned by the King. Gives power of attorney to daughters Mary and Anne (living in London) for Bentley Manor. Anne Billopp, step daughter of his mother Katherine. May have come back to Staten Island when daughters married. was second boy but died in childhood. Thomas Farmar signs document stating he is 36. Arrives in Phila in 1685 at age 10? 1735 when Thomas Farmar (Billopp) married Sarah Leonard of New Jersey. 3 sons and 5 daughters. More detailed information in Farmar book. Thomas Billop's first wife, Eugenia Stelle, dies at age 23. Captured twice. Once thrown in prison in Burlington, New Jersey and chained to the floor. Exchanged for a captain who had been on a prison ship. Second time he was released by George Washinton at the solicitation of Lord Howe. Thomas Farmar Billopp and brother Robert form 103 man army. Christopher reverted back to the Farmar name. Christopher retained Billopp. Parish) in Maryland for 50 years.